The tide has been coming in while I’ve been walking. The banks of the Avon, showing muddy when I started, are now covered by water. It takes me about an hour to walk through the Leigh Woods’ section of the trail. The banks close around me and rise high on either side as I begin walking through the Avon Gorge. To my right is a wall and a railway line. To my left the trees block the light and form a screen. After a while I feel rather claustrophobic – as if I’m walking in a tunnel. It is hard to see the river and, as yet, I’ve had no view of the Clifton Bridge. Despite the visual tranquillity, and despite meeting few people – just a couple of joggers, some cyclists, and two French hikers – this part of my walk is surprisingly noisy, due to the constant roar of traffic from the busy road on the other side of the river. I guess the steep walls of the gorge hold and magnify the noise. Growing tired, I feel frustrated, longing for my first proper view of the Clifton Suspension Bridge. This is the main reason I came down the Avon Trail in the first place! I begin to catch tantalising glimpses of the bridge through the screen of trees, and am really pleased when I come to a spot where the foliage thins out enough for me to clamber off the path and find a grassy spot on the bank. Finally. A proper view. There it is, ahead. Brunel’s wonderful bridge. Sad to think Brunel didn’t live to see it completed. After spending some minutes admiring the bridge, I begin to worry about meeting my husband in an hour’s time. If I stay on this path I will go under the bridge. But I need to get out of this gorge and get up to the bridge? A man is coming towards me. He stops for a chat and explains he is doing a circular walk through Leigh Woods and asks me about footpaths. There are plenty of tracks leading up into the trees, but few signs to guide us. I explain I’m confused too. We pull out our maps and my Garmin, and together work out where we are. He tells me about the track he has just come down. It will lead me up to the bridge he says. I can see it on my map, going up through an area with the wonderful name of Nightingale Valley. His warns me the information sign is obscured – by graffiti as it turns out – but I “can’t miss it”. When someone says you can’t miss it, that is almost a certain guarantee that you will. But the track is pretty obvious when I find it. Very steep. The surface is tricky. Slippery. 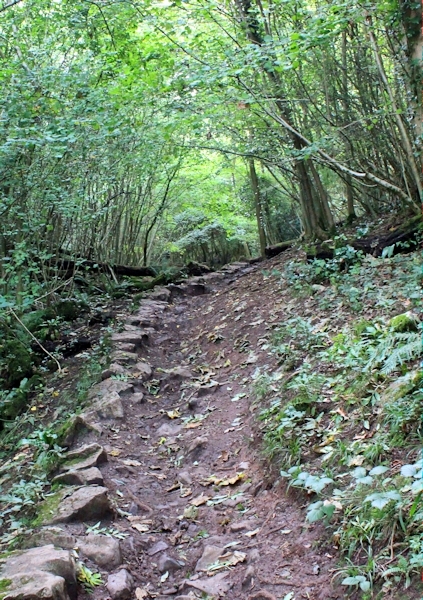 Large stones may have once been laid in a cobbled pattern, but seem to be piled higgledy-piggledy along the edges of the path, leaving a track of bare earth. It’s a scramble in places. I suspect the storms of the 2013-14 winter have washed the surface away. Half way up I meet a couple of young women sitting on a log. Their mountain bikes lie discarded by the path and they have stopped for a picnic. I am amazed they’ve made it so far on this difficult slope. It is dark under the trees and I meet nobody else as I walk up, puffing heavily by the time I get to the top. But the views are wonderful. I end up a little to the west of the river, and walk along residential streets to reach the access road to the bridge. There is my hubby. And we walk towards the river together, where I take numerous photos of the wonderful bridge. We cross the gorge and back again. The bridge is used by commuters – cars pay a toll, but cyclists and pedestrians can cross for free. Tourists stand and admire the views. There is the usual Samaritan’s sign. The light is fading as we take photographs of each other, reluctant to leave. I look back down the river, the way I have come. It’s a lovely view, especially with the tide high. And the view over the other side, looking towards the main city of Bristol, isn’t too bad either. It’s been a long trek today, and I’m feeling pretty tired. But I’m so pleased I decided to take this diversion up the River Avon. It’s been a wonderful walk and a great way to end the day. 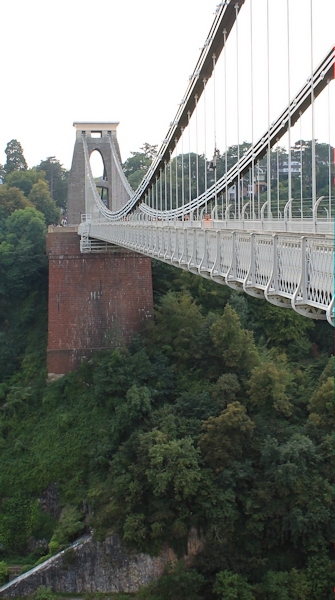 You can read about the history of the wonderful Clifton Suspension Bridge here. And more about Isambard Kingdom Brunel here. 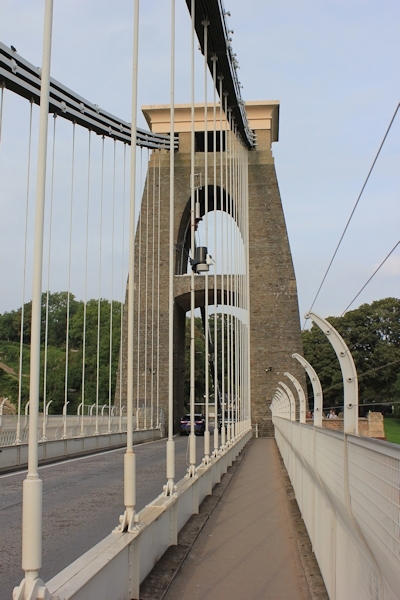 This entry was posted in 11 Somerset and tagged bridge, Brunel, photography, travel, walking. Bookmark the permalink. What a lovely route across the river, why didn’t I think of that? I crossed on the Avon Bridge downstream: not nearly so much fun. Great decision. 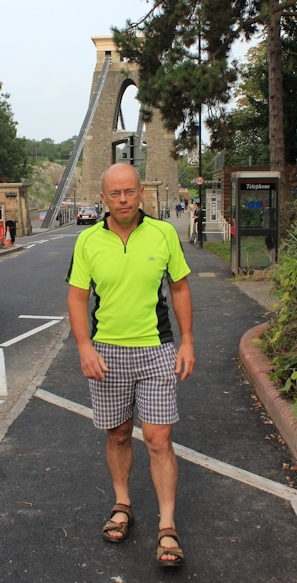 I too chose to use the magnificent Clifton Suspension Bridge to cross the Avon during my end-to-end. I must have spent at least an hour there taking pictures and talking to a friendly man working in the visitor centre. It’s a wonderful bridge and I’m glad I made the diversion. Clifton Suspension Bridge certainly is wonderful. Unfortunately when I was in Bristol a few years ago I didn’t have time to see it properly. Next time it will be a must.